This article was originally published in the American Tapestry Alliance's newsletter, Tapestry Topics, Summer 2006, Vol. 32 No. 2. It is reprinted with permission of ATA. Photos updated by author. Photo credit: Elizabeth J. Buckley. collage of preliminary designs for "Portal" and "Prairie Study"
When I contemplate how the element of chance or serendipity enters my work, I first think back to about twenty years ago to my early tapestries, when I wove directly from the gut, without cartoon, or preplanned design. I made it a daily practice to sit at the loom first thing in the morning, upon awakening. With the arrival of the dawn, my mind would be fresh and receptive. Still dressed in sweats and heavy socks, I would sit quietly at the loom, surveying what I already had woven, and envisioning what needed to come next. When I could picture this in my mind’s eye, I would pick up the different strands of colors and begin weaving, row-by-row in Mexican and Rio Grande techniques. Each day at the loom, I would enter a space in time of deep listening and focused attention. The emerging tapestry and I engaged in this dialog of shapes emerging, one edge leading to another, one line suggesting another or the beginning of another form. As my designs grew more complex, I found I could not keep all the details in my head. I realized I needed a way of making a road map on paper, to track the overall idea, and with lots of room for interpretation and suggestions from the growing tapestry. I began with charting what I had woven, so that when the tapestry was rolled around the front beam, I would know what had come before. Then, I tried putting thoughts and images on paper as I began contemplating the next tapestry. How my art school training had not prepared me for this! I struggled with how my drawings and watercolors on paper could not reflect what I ultimately wanted to end up with in tapestry. Thus, I began my quest: how to make media on paper help flush out the idea in my mind’s eye, so that I would be ready to weave with some sense of where I was going; how to create a cartoon that would not be a dictator, but a guide to help me. I began studying French tapestry, and to my surprise, found myself easily shifting from weaving row-by-row to building up shapes and working with positive and negative space. I resonated with this approach, because it allowed me to focus on specific areas as I wove. Even working from the back somehow felt better to my brain. Next came going to Aubusson, to immerse myself in the milieu of this centuries- old tradition, to weave in an atelier, to learn by doing of the process of cartoon development and of how techniques synchronize with the design. I replicated a small section of an historical tapestry, from drawing the cartoon to matching the color palette and woven techniques. I spent hours studying tapestries hanging in museums and galleries, gazing upon and listening to what each had to tell me. I was surprised to realize that I could adapt from my previous art training the graphic design and color theory principles that could help me to think in the language of tapestry. I returned to the States, with a sense of the wind blowing through my previous frustrations. It felt like an opening to limitless possibilities. I began to sense how to find my own way of working, which still would incorporate the element of spontaneity and simultaneously provide me with a road map. Now, I actively invite the element of chance and serendipity into the initial design phase. Often, the general feel of an idea brews in my mind for weeks or even months, while I am finishing the weaving of the current tapestry on the loom. When I am preparing for the tapestry yet to come, often I enter into a period of waiting for connections and images to begin forming in my mind’s eye. Always I ask myself the question: what needs to be explored and expressed next in tapestry? These periods of waiting are not idle. They are full of preparations toward being ready for the creative moment to take shape. Often I see more clearly when drawing. It helps to focus my eye, to look intensely at shapes and shadows, their edges and textures. My hands seem to know something my mind cannot yet grasp. I make sketches, paint in watercolor, play with pastels or charcoal and see what comes out the end of my fingers. As I create shapes on paper, one idea leads to another. Relationships between images, shapes and colors begin taking on energy and life. I pull out tracing paper and begin outlining some of what I have generated, and start shifting and layering, enlarging or shrinking sizes. I drift toward the bins of yarn, pulling out shades and tints of different colors that I am drawn to, and I heap the skeins and balls in groups all over the tables and floor. From all of this, the design for the next tapestry gradually emerges. I still prefer weaving when I first awaken in the morning. 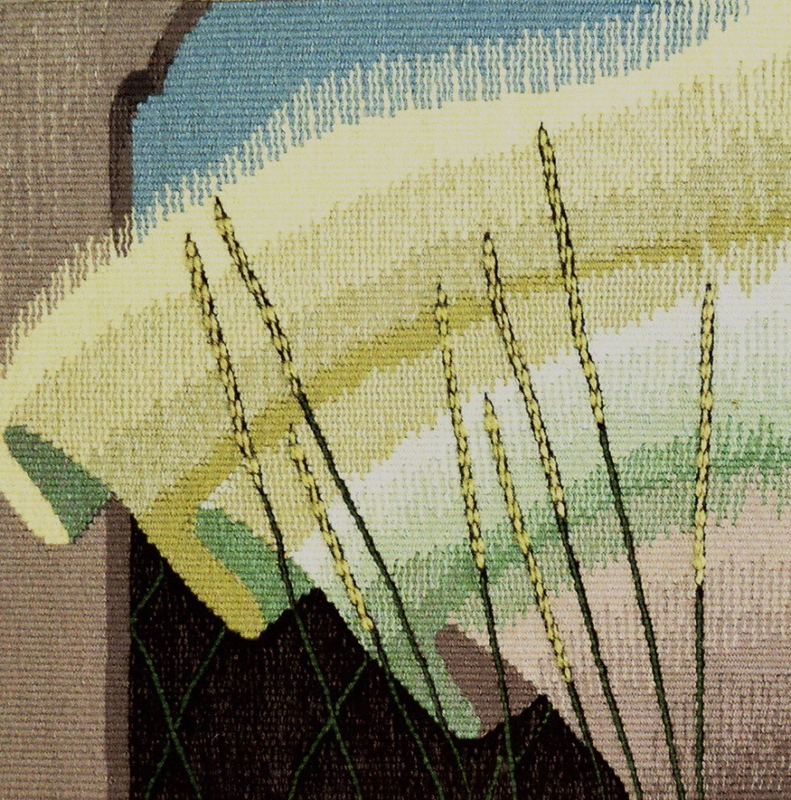 I still enter into an oasis in time, as I engage in a dialog with the tapestry in process. In addition, I now have a full-scale value study of the design mounted where I easily can see it from the loom. Now, there is a cartoon beneath the warp, delineating curves and shapes, with lots of blank spaces. I wind a lot of bobbins, with theme and variation of color blends and then choose my colors at the loom, as I weave. There are times I am weaving on a tapestry, and I discover I am bogging down in an area. This is my cue to stop weaving and walk away for a short while. The tapestry is informing me that the area I am working in needs adjusting, be it a different color or value, or be it a shift in the design. In the winter, I go outside and split a few logs for my wood burning stove in the studio. During the growing season, I tend the garden. Usually during these breaks, I find ideas suddenly occurring to me around what needs to happen next in the tapestry. Sometimes I end up patching the cartoon with a design adjustment. Other times I simply need to change the color blend on a bobbin or a value, which might require taking out a little bit. How I love this unfolding process of listening to what the tapestry is telling me. It is like improvisation in jazz, where themes reoccur, then variations off of a particular phrase, or taking off on a tangent that then becomes related to the overall whole. So, too, in tapestry. Only when it comes off the loom, do I fully know and behold it for the first time.